The silver-glass structure is an example of a "hyperbolic" metamaterial, which treats light differently depending on which direction the waves are traveling. 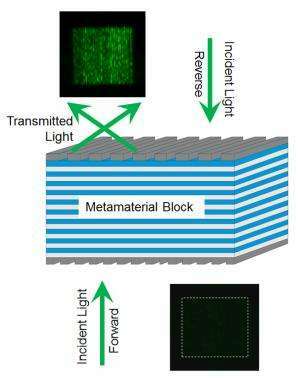 Because the structure's layers are only tens of nanometers thick—much thinner than visible light's 400 to 700 nanometer wavelengths—the block is opaque to visible light coming in from outside. Light can, however, propagate inside the material within a narrow range of angles. In the future, the new structure could be integrated into photonic chips that process information with light instead of electricity. Lezec thinks the device also could be used to detect tiny particles for biosensing applications. Like the chrome grates, nanoscale particles also can deflect light to angles steep enough to travel through the hyperbolic material and come out the other side, where the light would be collected by a detector. Xu has run simulations suggesting such a scheme could provide high-contrast particle detection and is hoping to test the idea soon. "I think it's a cool device where you would be able to sense the presence of a very small particle on the surface through a dramatic change in light transmission," says Lezec.